The last six months have been a busy time in the BBC Writersroom Belfast office. 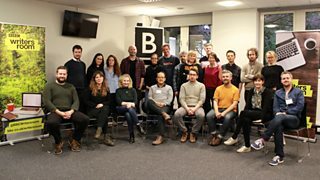 Not only have we launched an opportunity for BBC Three, we have helped secure writers' commissions on a television series, a Radio Ulster sketch show, recommended writers to agents and producers, developed writers spec' scripts in Belfast Voices and appeared at several local festivals. Find out more about what has been happening in Belfast since our last blog post below. 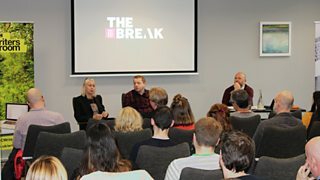 In early October, we were thrilled to announce the launch of The Break Series 4 in Northern Ireland. 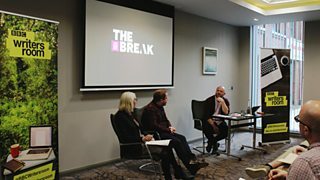 The submission window was opened at a special event in Belfast hosted by Tommy Bulfin (Commissioning Editor for Drama) and Anne Edyvean (Head of BBC Writersroom). The writers in attendance were given an insight into the scheme, how the series has evolved and the ambitions for Series 4. 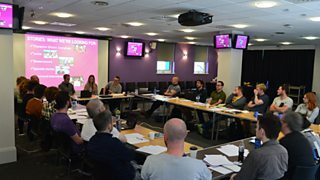 The lively discussion also included tips on what the reader will be looking for in your submission, what makes this part of the world special and what resonates with a BBC Three audience. Interest in the scheme was incredibly high, with a significant increase in the number of submissions from Series 3. 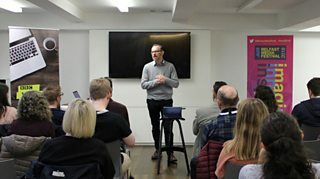 A workshop was held for twenty-one selected writers on 10th December when the writers learnt more about the series and how best to write short form for an online platform. From the pitches developed in the workshop, nine writers were selected to have their monologue scripts developed. Early next month we will announce the five writers chosen to have their episodes filmed and broadcast on BBC Three later in the year. The Comedy Unit’s mockumentary series Soft Border Patrol was commissioned for a second series, and the BBC Writersroom was once again asked to assist with getting some of the best local comedy writing talent on board. So, in mid-summer, we invited a group of the writers to join us in a semi-darkened room for a top-secret workshop. 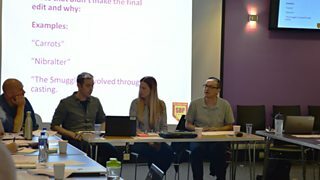 Hosted by Rab Christie (Executive Producer), Marie McDonald (Producer), Marc McElroy (Story Producer) and BBC Writersroom’s Keith Martin, the workshop took the writers through how the show was written. The writers learnt the type of stories that the show wanted, what worked best in Series 1 (and what didn’t) and explored each character on the show. During the session, writers were given an opportunity to speak one-on-one with one of the team to get feedback on some of their initial ideas. A total of 18 writers were commissioned to provide material for Series 2. Five episodes were broadcast from mid-February on BBC One NI. 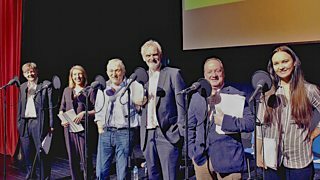 Returning for an eighth series, Tim McGarry, writer, comedian and member of The Hole in the Wall Gang offered an opportunity for emerging comedy writers to submit material for Radio Ulster’s A Perforated Ulster. Tim presented a writers' workshop about writing topical sketch comedy for the radio and specifically for A Perforated Ulster. The writers were led through the development and production process for the show. Using examples from previous series, the writers learnt what length of sketch and subject matter works best on the show. Tim even shared some insider information on the regular characters. The writers were given an opportunity to submit sketches and one-liners for each episode of the latest series. We are pleased to announce that five writers had material commissioned, with some gaining their first radio credit. We would like to extend our thanks to The Hole in the Wall Gang and especially to Tim McGarry for the opportunity to be a part of the show. 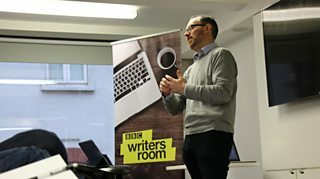 BBC Writersroom presented two sessions at the Belfast Media Festival in November. 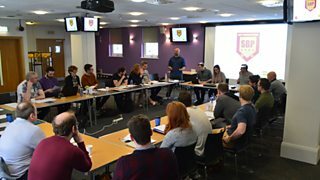 Our first session ‘Writing that Sitcom’ was hosted by James Cary and aimed at giving new and emerging comedy writers the confidence to write their first sitcom. Using his experience on shows like My Family, My Hero, Citizen Khan, and Bluestone 42 (which he also created), James provided insight into how to create funny, unique characters and how to make them drive the comedic heart of the story, as well as the challenge of writing the pilot episode. 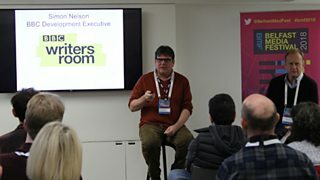 The second session on how to ‘Get your script submission-ready’ was hosted by BBC Writersroom’s Simon Nelson. Simon presented a practical and thought-provoking session to help writers get their scripts ready to submit to Drama Script Room. The pair covered the purpose of Script Room (our open submission script window) and what we are really looking for when reading your script, as well as the top tips on how to address problems in your story. The session wrapped up with a Q&A. 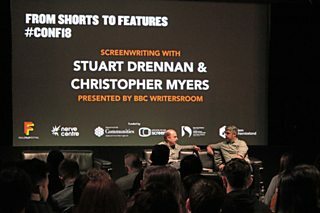 For the first time, BBC Writersroom was part of the Foyle Film Festival and presented a talk at the Shorts to Features conference day. Writer Stuart Drennan and Producer Christopher Myers spoke about the challenges of making the move from writing short films to features. Their talk was a practical guide for newer writers, covering the development process, getting notes and working with a producer. Stuart’s debut feature The Dig was the winner of the Best Irish Feature at Galway Film Fleadh 2018 and a Discovery Award nominee for the British Independent Film Awards 2018. Our next open submission window (Script Room) will be open from 1st - 29th April 2019 for Comedy scripts.